It was surprisingly sunny for the time of the year. The Epping line train packed to the max. The stations fly by, the tension mounts, today we play a new team, the first time since their inception. That team is the “Camry Crows”. It’s a new era in supporting attitudes. The visitors have never been here before and the state rivalries are now a full reality in the home and away competition. What will happen is the main thought in that crowded train carriage that is a sea of Black and White. Will we win? How much will we crunch these new upstarts by? As we pass through Clifton Hill station and cross over the Eastern Freeway the Mighty Magpie on the Social Club comes into view. The crowd stirs and utterances of Go Pies and Carn’ the Woods get louder and more forceful as if to will the team to victory. The crowd spills out of the train in relief, now being able to move and have space. This won’t be for long from the footbridge we can see the crowd milling outside in Lulie Street already snaking from the turnstiles, which means another packed house. But a new element has emerged. The visiting supporter buses have arrived. The very new scarves, t-shirts, beanies, caps and other supporter gear are visible in unusual colours. Navy, gold and red. Nervous faces peer down from the buses. The milling Black & White throng notices the new arrivals and point and jeer. Not surprisingly police are present to ensure that no transgressions occur. This does not dissuade the protected ones who upon seeing their guardians have a newfound courage to taunt and deride the Magpie faithful. What could have turned ugly became a non-event as these supporters are quickly ushered into our hallowed arena. This little cameo over with, we quickly pop into the Club for a few “frothies” and pies before the game. The Social Club is abuzz with anticipation. A new team means a new foe to despise and for Victorians even better that they are from S.A. We make our way to our usual possie in the Rush Stand about three quarters up to get the best view and stake our claim of concrete standing room. More and more people squeeze in and our territory is reduced to the bare minimum. Friends are quickly made with those in the immediate area as the occasional steadying hand is placed on the shoulder of strangers with a polite “Sorry mate”. Then “The Voice” kicks in. The mysterious Magpie supporter with the screeching voice heard above the din and generally in moments of quiet. “The Voice” has become a noted fan of Gary Pert, the new addition from Fitzroy. It is an extraordinary voice one that is uniquely football … “Go Puurt!” and the ever popular “Puuurt! !” “The Voice” was heard but never seen, yet was Vic Park to a tee. One notices on such a day as this, where the crowd is literally jammed into the terraces and over at “One-eyed Hill” the Trennery Crescent (or scoreboard) end, that the game becomes almost secondary. Sure oohs and ahhs, applause, cheers and chants accompany the game’s highlights. Self-preservation however comes to the fore as the swaying crowd forces you to concentrate on not falling over and squashing someone’s kid or someone’s mother. So here we all are on this thankfully sunny’ish day, all 29,125 of us. But today we also see the bussed in supporters hidden in the left pocket of the railway or Lulie Street end. Waving flags and floggers and attempting A-D-E-L-A-I-D-E chants only to be drowned out by the arrival of the teams and the roar of the Magpie Army. 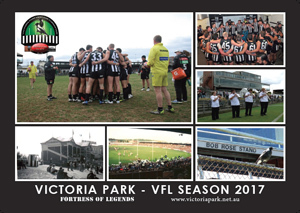 The game commenced to no extraordinary fanfare other than the usual Magpie mania, this was Victoria Park and Collingwood were the reigning premiers and the Adelaide Camry Crows were here to be initiated into the horrors (for away teams) of Victoria Park. The game in the first quarter on the scoreboard was a fairly even affair with Collingwood kicking 5.3 to Adelaide 3.4. However the game in the second quarter saw the hapless Crows start to run in circles, their heads spinning in this unfamiliar patch of green in the midst of terrace houses and saw-toothed industrial buildings. They added a solitary point to be way in arrears – Collingwood 11.7 & Adelaide 3.5. The usual half-time hubbub and murmurs accompanied the mass exodus under the Rush to the bars, pie stands and toilets. Because once you were in the stand you were in. No escape till quarter time breaks. Then the warning siren sees the rush back to somewhere near where you were standing, as you attempted to regain some portion of your previously-held section of the terrace. The third quarter was more of the same as the Pies started to pour it on. Collingwood 18.11 to Adelaide 5.6. The crowd was now focusing on the Adelaide supporter’s pocket, as goal after goal was met with chants and cheers. It was an assured result now and just how much was the question now. The final quarter told the tale, Collingwood 23.22.160 to Adelaide 5.7.37. Laughter and applause helped the Pies from the ground and boos for the Crows and the Umpires. It was after the ground was clear of players and officials that Collingwood FC officials suddenly realized that the Crows supporters were still there and becoming even more of a focus. The stunned supporters who after a 123-point drubbing were immobile, jubilant Pies supporters were welcoming them to the realities of the AFL and life at Vic Park. Luckily sane heads prevailed and nothing too untoward occurred. We saw a few of the Magpie brethren trading witty repartee such as “Losers” chants and the like but we had a more important task of making it across the ground without some little tacker kicking a ball into your face. Safely arriving at the members’ race, we enter the Social Club for the lusty repeated verses of Good Old Collingwood Forever and later Cold Chisel in the Magpie Disco. A footnote to the above was I was also able to attend the return bout for our first trip to Football Park. 17 May 1992 Round 9. You could taste the anger in the air; revenge was at hand for the Crows supporters who had packed out Football Park to the tune of 44,723 (of which we estimated 5,000 Pies supporters). A close match all night saw the lead change many times. The end result was too sweet for words Adelaide 9.10.64 defeated by Collingwood 9.15.69. 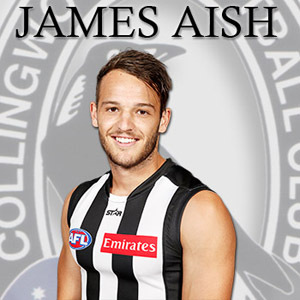 Pies by 5 points !! The way out was perilous but thrilling, we came, we saw, we beat them AGAIN !! 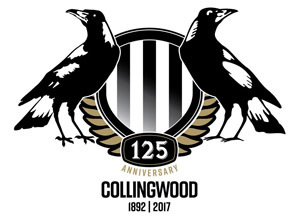 Long Live Collingwood – Long Live Victoria Park.